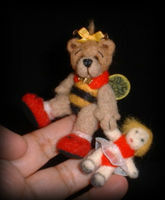 "Summer Bee" is a 2 1/2 " tall beautiful little girl bee holding her favorite doll, She is a needle felted creation,black onyx eyes& glossed embroided nose, string jointed, wings & 2 wire antenna , she has a tiny golden brooch and a silk bow on her head... 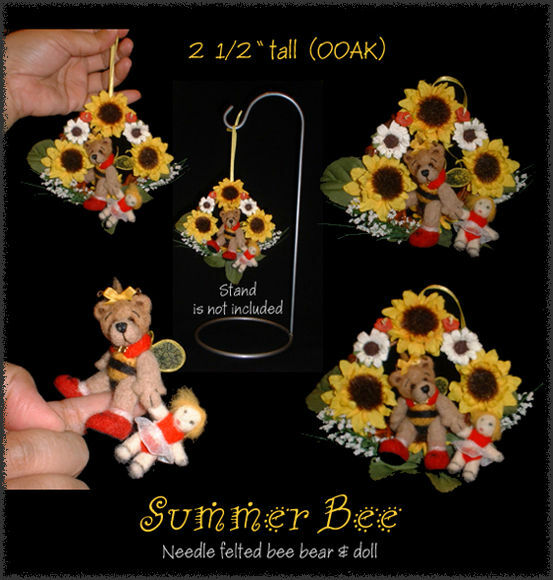 Her doll is also needle felted , she's around 1" tall and also jointed..
she comes sitting on her Summer flowers reath, just enjoying herself , looking at all the fun around her, she's still a baby bee , so no work or duties for her , only playing and having fun.. The reath can be hangged by a stand or mounted to the wall or whatever way you like , it's a really decorative piece , and really fun to look at! ..